Hey guys! It's Shimmy Shimmer swatch time!! Hope you're not tired of them yet, because I'm sure not. Holy poop, have I got some good ones for you today. The first one in particular, ahhhh, just wait. As I've said in my previous posts, Shimmer Polishes are very complex and full of so much fun glitter. I've just died and gone to glitter heaven. For real. I don't even know what to say about this polish besides I lalalove it and want to put it over everything. Another major, major winner. I could stare at the glitters for ages! The blues and purples are so nice, and then all the other colors... 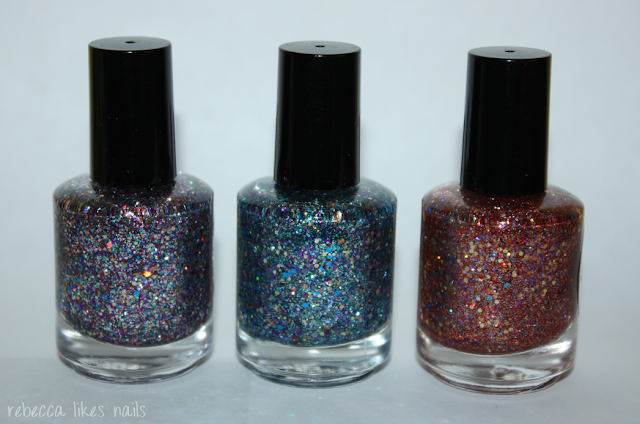 I just love how there are so many different glitters in each polish, they're so interesting and fun and sparkly. Again, I've got no more words. Just let the pictures do the talking. This one isn't on my list of favorites due to me not being an orange fan, but despite that, it's still gorgeous! I really like the teeny tiny silver glitter, and the blues and pinks go nice with the overall orange tone. Orange fans should definitely check this one out. Hehee I'm so pretty! ;) These glitters are awesome, some much colours in one bottle!